It’s a little late this year due to the non-stop celebrations of Christmas/New Year/Ukrainian Christmas/Old New Year which have finally come to a close after almost 3 weeks of celebrating. Now I can finally get back to work and normality and share my thoughts on 2018. It’s been another impressive year for travel and TripIt tells me I’ve travelled 92,774km, spent 198 days away from home over 8 trips, along with visiting 10 different countries and 41 cities whilst taking over 40 flights to get around. As there’s so much to tell, I’ve broken everything down, month by month instead of simply listing the highlights like previous years. 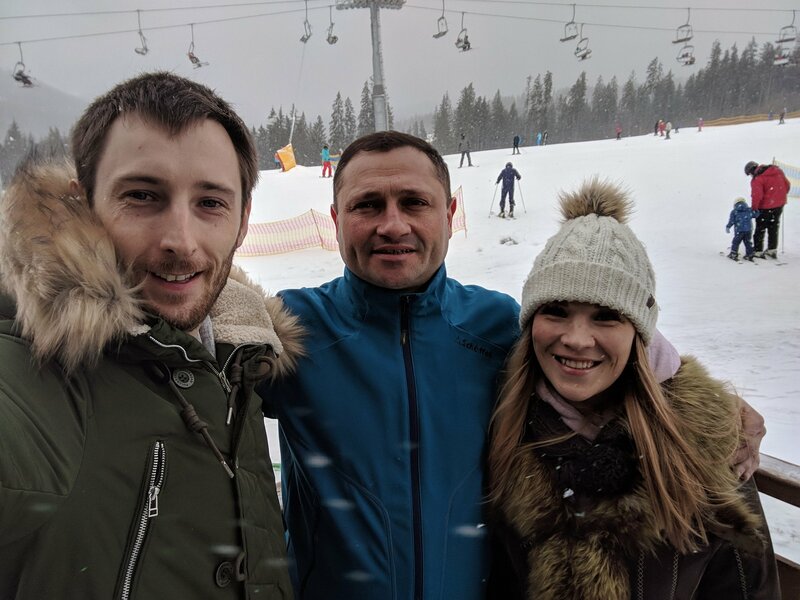 As seems to have become a biennial tradition, we travelled to Bukovel, Ukraine for a few days to have another attempt at Skiing. Whilst the snow wasn’t perfect, we had a great time and met some familiar faces from our last trip there. February is my birthday month and we took the opportunity to tick 2 items from my European bucket list including visiting the unique Wuppertal Suspended Monorail and a weekend staying in a treehouse at the magical place that is Efteling. Like most other years, we also visited Utrecht to the annual A State of Trance Festival. We won’t be repeating the same again this year as we have bigger and better plans in March to visit Tomorrowland Winter in the French Alps for a week of music and skiing. March was spent in Barcelona for Yuliya’s birthday where we visited Montserrat, Port Aventura, Salvador Dali Museum and took a skateboarding tour of the city. April was mostly a working month and the highlight at the end of the month was a visit to the festival of retro cars which was set in State Aviation Museum in Kyiv. A rather unique location combined with a relaxed atmosphere, music and drifting, it was a great experience. May was also pretty uneventful with the highlight being my first visit to the city of Kharkiv. I didn’t have high expectations as it generally isn’t deemed a touristy place especially for foreigners. However, I ended up really enjoying it especially Gorky Park which has many European style attractions and one of Ukraine’s few rollercoasters. We also attended a food festival, but that story is better left untold. In June I was invited to visit the Google HQ in London to celebrate AdSense’s 15th birthday. If you don’t know what that is, it’s Google’s advertising product for publishers which I use on Convert Case. It was a honour to be invited and take part in something among other successful entrepreneurs most of which have multiple web sites with hundreds of pages compared to my simple single 1 page site. The cake wasn’t bad too. Beer and food delivered to your seat on the RailJet train. July started with a trip to Munich to visit some friends who invited us to go to the DAHO.am tech conference together. We also took a tour of the BMW plant which was incredible to see the amount of automation and robots involved in making a car along with the few jobs which are still done by hand. After that, we took the RailJet train to Vienna which was quite cool as you could order food and beer to your seat via your phone. In Vienna, we rode an alpine coaster along with visiting the Prater amusement park where there is a historic ferris wheel along with a rollercoaster restaurant which I’ve wanted to visit for a long time. In an unusual twist to our normal trips, we took a package holiday to Turkey to stay in an all-inclusive resort for a week of pure relaxation. We never even left the hotel complex except one day when we went white water rafting. We even had a free day and hotel stay in Istanbul on way back due to a missed flight connection. October was rather quiet, but came with a nice surprise. I have an Australian client who bought a $10 contact form script from my web site over 10 years ago. Since then we have been working together on many different sites and recently he had won the regional small business awards for his newest project, 123 Tix and invited us to the state finals in Sydney in November. After a lengthy visa application which was finally granted a month later, we started planning our mega trip half way around the world. The time had come for our trip and after over 24 hours of travelling we arrived in Sydney. We had a few days to ourselves before meeting my client for the first time outside a suit shop downtown. We’d never spoken or seen each other people except on photos and via text chat so it was a rather special meeting. Luckily we got on well and he showed us lots of cool places in the city before we attended the business awards. He didn’t win unfortunately, but it was still a great achievement. We then spent a week in Dubbo with his lovely family who treated us as one of their own and it was so interesting to see all these local businesses which I’ve had a hand in developing web sites for over the years. I even bought my first actual ticket on his web site with real money in order to visit the local jail. After that we had another week in Cairns to discover the rainforest and great barrier reef. We tried to see as many sides to the country as we could in the little time we had. Everyone has heard of the big rock in the middle of Australia so we had to visit it. It’s called Uluru or Ayers rock and what I found fascinating was that it stretches for 6km underground and was carved out by a river and at some point it turned 90 degrees so one end of the rock is actually older than the other. It was impossible to do anything in the day as temperatures were around 40 degrees celsius, so we had a lot of early mornings and late nights in order to do any activities. We had dinner under the stars, sunset by camels and a breakfast sunrise along with another sunrise by helicopter. Our last stop was in Melbourne. We were very unlucky with the weather as it was very changeable and often sudden rain storms happened which made planning difficult. We still enjoyed it and saw most of the city including a visit the the world’s largest IMAX cinema screen and rode the world’s second oldest operating rollercoaster in nearby, St. Kilda. It’s been a great year which will be hard to beat in the near future. We visited so many places and had so many great experiences along with finally meeting my oldest client, who has now become a great friend. Work wise, I hope to continue working on growing Convert Case with more advanced functions in order to attract more visitors and look to launching Kyiv Guide in 2019. Published on January 16, 2019 in Travel by Jason and tagged with 123 Tix, 2019, Australia, Awards, Ayers Rock, Barcelona, Bukovel, Dubbo, Efteling, Emirates, Featured, Google, Helicopter, Kharkiv, Rollercoaster, Skateboarding, Skiing, Sydney, Train, Travel, Treehouse, Turkey, Ukraine, Uluru, Vienna, Year in Review.